1. I don’t know what I feel like eating. 2. I’ve had a recent string of failed recipes. The kind of failures that no one wants to eat, including me. So yesterday, when it occurred to me that what I could really go for was some hearty stew, I was so happy. Problem #1 solved. Once that was behind me, I practically crossed my fingers the whole time I made dinner, hoping that Problem #2 wouldn’t show up along the way. I am happy to report (super, super happy) that this recipe was delicious. So good, that I was glad to have it again for lunch. Looked forward to it, even. From start to finish, this stew is pretty quick to make. After some prep work, it comes together quickly and finishes in around 15 minutes. Whiskey, tomato paste, and beef broth form a flavorful base for this thick, chunky stew. It is very hearty, but still came in at 200 calories per serving. For me that means I can add a little crusty bread and some fruit to the meal which makes it much more satisfying without too many calories. I loved the stew, and will definitely make it again. 1. I used 2GINGERS Irish Whiskey. It was delicious, but you could substitute your favorite whiskey (and I know you have one). 2. If you don’t have any whiskey, you could substitute bourbon, brandy, red wine, or dark beer. Each one would add a lot of flavor to this stew. 3. 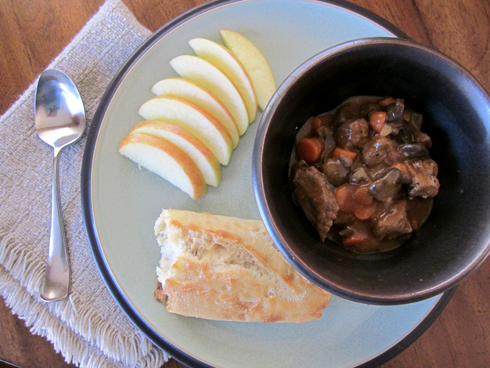 If you would like to make it alcohol-free, it would lose some of the flavor that the whiskey brings, but would still make a mighty tasty stew. If you omit the alcohol altogether, add an extra 1/2 c. of beef broth and an extra tablespoon of tomato paste. In a large deep skillet, heat olive oil over medium high heat. Add venison and cook until browned, about 5-7 minutes. Remove venison and set aside. Add carrots, celery, onion and garlic, and cook for 3 minutes. Add mushrooms and cook another 2 minutes. Add flour, stir until well combined and cook for about a minute. Add whiskey and stir to combine, it should start to thicken and bubble. Add beef broth and tomato paste, stir well and bring to a boil. Reduce heat to a simmer, cover, and cook for 15-20 minutes. Stir in fresh parsley and serve. – Don’t like mushrooms? You must be my brother Ryan! Whether you are Ryan or someone else, you can leave out the mushrooms but you may want to add something else in its place like diced potato, sweet potato, or red bell pepper would be my top choices. – This recipe would be a good contender for the crockpot. However, to build up the base of the soup, it really needs to start out in the pan. The last 15-20 minutes of cooking could be replaced with 2-4 hours in the crockpot on low. The advantage here is that you could start the whole thing out earlier in the day, and serve it up when you are ready.